Show all pages in an alphabetical index or by topic. 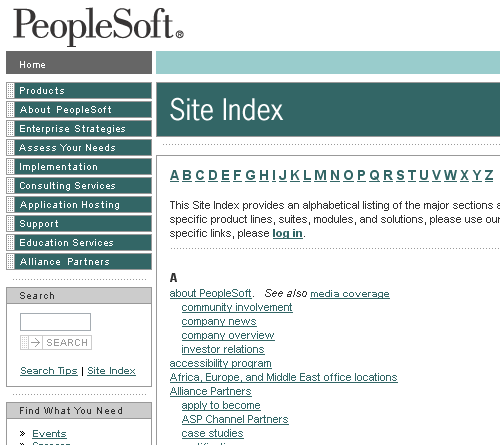 A large website with search and main navigation. Typically for beginning users that are not very familiar with the information architecture of the web site. Such sites typically have other ways to access the information such as main navigation or search box. There may be too many pages to show in one page and pages may be related by topic. Using an index the users can look for a keyword and go directly to the page. This way the user does not have to understand the information architecture of the site. By grouping pages under topics, users get the possibility to search by "topic". 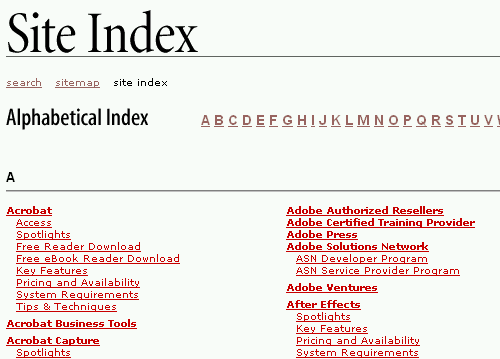 This nice example from the Adobe website shows a clear hierarchical index. In addition there are links to other search related functions such as the search function and the sitemap.